The new Submariner series is the best marine grade lock out there. 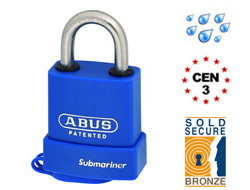 It is developed from the new ABUS Extreme range which is already regarded as a weatherproof marine grade lock. 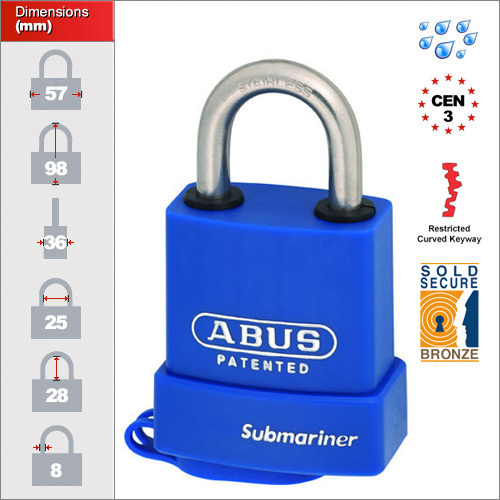 They then improved on it further to produce this Submariner series which is currently used to lock up the North Sea wind farms in a saline environment which would destroy a normal padlock in days. The whole lock uses stainless components and a ball bearing locking mechanism which is much more resilient to the weather than a normal spring loaded locking mechanism. 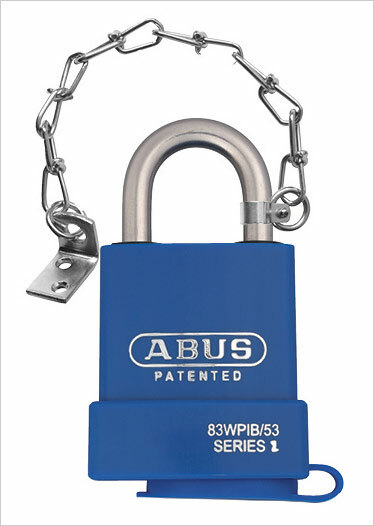 A sealed body, key guard and ultra-tight shim guards on the shackle help prevent excessive exposure to the elements. If you require additional keys then please visit the "additional keys" section from the menu on the left and add as many as you need. If ordering over 50 extra keys it may add 1-2 days on delivery. There is only one size of Submariner at the moment but do see the Extreme series also as there are two sizes available there. The Submariner is developed for use in environments that are subject to salt water. They are ideal for yachts, moorings, ships, containers, off-shore platforms and any other harsh environments where all other effects to prevent rusting have failed.